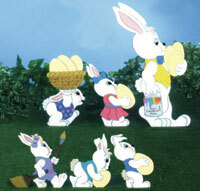 It is time once again to decorate the eggs and Mr. Bunny has all kinds of help. This friendly bunny is sure to get lots of smiles from passer-bys and neighbors. 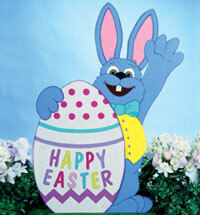 He's easily made using our full-size pattern, exterior grade plywood and a jig saw. 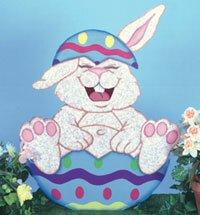 Passers by will be delighted to see this giggling Easter Bunny in your yard. 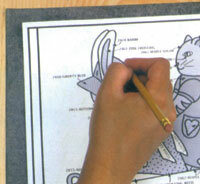 You can make him from plywood using our easy to follow, full-size pattern. 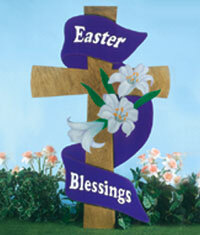 Pass on the spirit of Easter when you display this easter greeting in your yard. This project can easily be made from plywood and paint when you use our full-size pattern with complete instructions.